You can easily create your own invitation for your wedding at home at loads less than you’d pay to have them printed by a professional. Plus the do-it-yourself approach is easier today than ever before thanks to lots of online stationery vendors who want to provide as many options as possible for customers. Before you jump in, however, make sure you know what materials you’re going to need. First, you should look at your paper options. Many of the online stationery vendors sell blank card stock paper you can purchase in a variety of designs. Some even sell kits that contain all of the paper you would need to create your own invitation. But you don't have to have all of these! Some people will just send the invitation and have guests RSVP to an email address - this is great in keeping all replies together, small pieces of paper can easily get lost!If you’re trying to save money, you can choose to use a postcard-style response card. You’ll save on postage (post cards are cheaper to mail, typically) and you won’t have to purchase an extra envelope. When you’re buying paper, make sure you purchase card stock. This type of paper is heavier and is the same type used by printers of invitations and greeting cards. Using regular printer paper won’t do the job. Before you order, be sure to make sure the paper is compatible with your type of printer. Most of the paper will work with no problem in laser printers but may have problems in some types of inkjet machines. You can usually order a sample of the paper to test out the printing before you place a larger order. While paper is the primary material you’ll need to create your own invitation, there are some other things you’ll need or want. First, make sure you have all of the ink or toner you’re going to need. You don’t want to get started with the printing only to run out of ink, particularly if you’re using any type of colored ink in the printing. Second, you may want to find a good wedding font. Sure, your word processing program probably comes with dozens of fonts and some of them are pretty nice but for a special occasion you might want something a little more wedding-like. Just do a search through your favorite search engine for "wedding fonts." You’ll find many choices available. Just choose the font you like the best and download it. A fee is required for some of the fonts. Others are free but some of the sites hosting them can be dangerous to your computer so be careful. Third, you might want some accessories to create your own invitation. 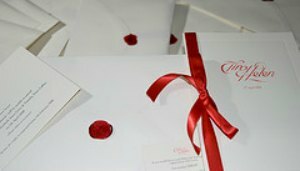 Many couples love to decorate their invitations with ribbons, dried flowers, or other types of decorative accessories. You can find many things to choose from at the same sites selling the paper or even at your local craft store. Don’t do anything too complicated because you don’t want to take away from the simple beauty of the invitation. A nice ribbon or piece of transparent tissue paper covering the invitation would look great. Fourth, you’ll need a word processing program or a publishing program so you can set up the layout of your card on your computer. Keep things simple. You can add some art, such as the image of a rose, to the invitation but you don’t want to drain your ink too quickly with complex artwork. Always print a sample on regular paper first. Then print the rest of the invitations in small batches of 5 or 10 so you can keep an eye on the print quality and change the ink as soon as it becomes necessary. After you give the invitations time to dry completely (usually wait a couple of hours or overnight to make sure the ink doesn’t get smudged), start assembling them so you can mail them. That’s one of the last big things on your to do list before you get to say "I do." To save you time and also money here are some great cheap wedding invitation kits that are cheaper than doing everything yourself.